A South Carolina senior slayed his prom's red carpet in a stunning two piece ensemble - however his dress sparked negative backlash online. 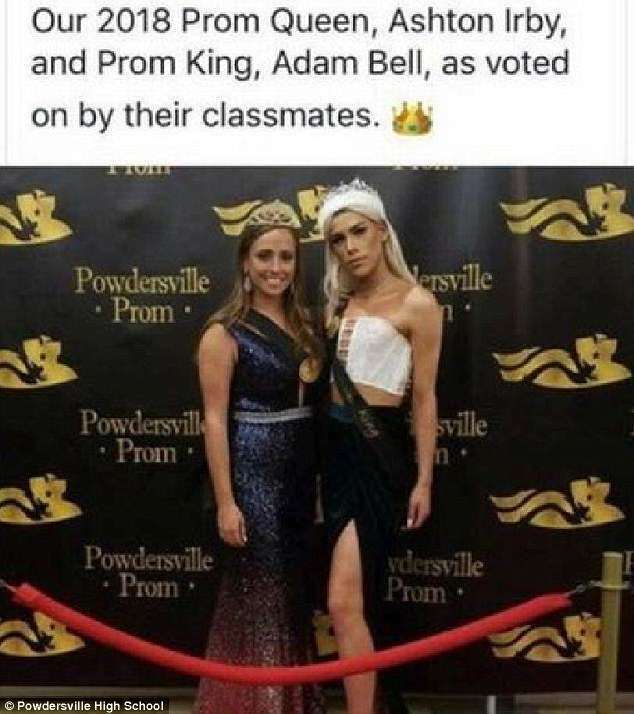 But the online heat didn't bother Adam Bell, 18, who says he has the support of his peers who voted him as prom king knowing he'd wear a dress. 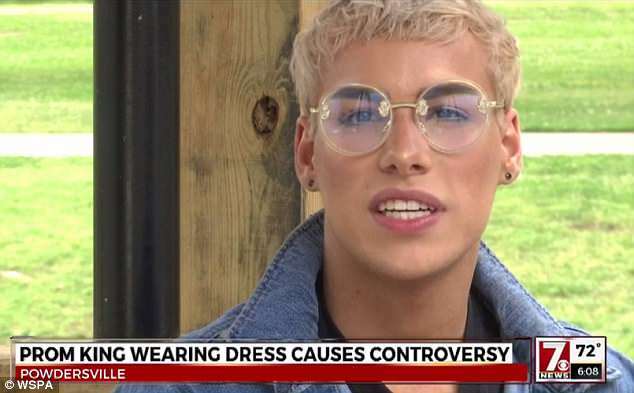 In fact the openly gay honors student says he will sport a dress again for Powdersville High School graduation in defiance of the online trolls. 'Wearing a dress is like my version of dressing up, like most guys version is wearing a tux and mine is more feminine,' he said to WSPA. 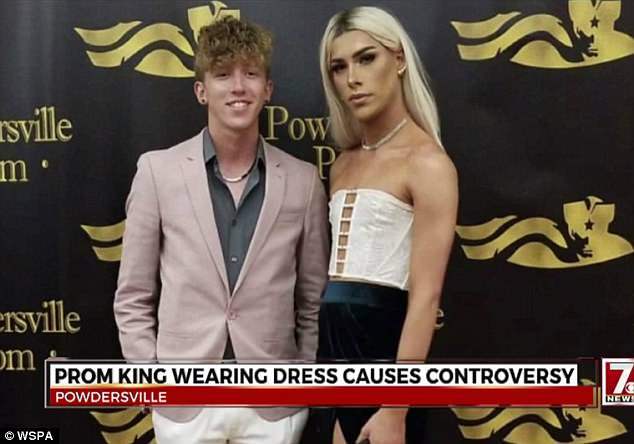 Bell said he won 49 per cent of his school's votes for prom king and added that he's worn dresses to special events at school before, according to Fox Carolina. He even made sure to stick to school dress code rules for his look of a white crop top and emerald green slit skirt. However his careful measures didn't stop online trolls from attacking him after the prom images were posted on Facebook. 'Was this a joke or for real?' one woman said. 'This is gross! there is a prom (king) and Queen. Now two Queens!' one user wrote. 'Call me names or whatever but I think this is ridiculous! The "king" is a male and should be dressing like one. The only reason kids act like this is because we allow it and think it’s ok. In my opinion it’s not!' another wrote. 'It looks like the northern end of the county has leaped off the cliff of sanity,' a Facebook user wrote. Despite the online hate there were many Facebook users that came to the teenager's defense. 'I think what people are failing to realize is that his class voted him King. So if they are accepting of it - then none of what we say or think should matter. I honestly think people are making too much out of it.,' Misty M Jones defended. 'Lots of bigots on this thread. Pitiful,' another wrote. 'The prom king rocked that s***, there's absolutely nothing wrong with looking that glamorous!' one Facebook user praised. 'Good for this kid and kudos to Powdersville High School for showing some 21st Century class and acceptance,' another user added. Bell said that he did not anticipate any online hate given how supportive his school has been. 'I didn't because my school has been so supportive the whole time. They've seen it on a daily basis from me so it was nothing new to them,' Bell said to Fox Carolina. 'For every one negative comment, I was responding back to seven positive comments. I never responded back to any of the negative ones,' he added. He explained that he was grateful for his peers who stood up for him in the comments, even if it meant disagreeing with parents. 'But the kids were actually the ones standing up to the adults and being more supportive than ever. I greatly appreciate all my friends and even people I haven't even talked to at the school who were standing up to the adults and even their own parents who would comment,' he said to WSPA. Bell, who is in a beauty program with a make-up retailer, says he isn't deterred from wearing a dress for graduation on May 24 too. 'Pretty much do anything you want as long as it's not hurting someone else. As long as you're expressing your true self and it's not harming anyone else, go for it,' he said. Since the incident the school released a statement saying they've deleted the prom images due to the hateful comments. 'This weekend Powdersville High School hosted it's annual junior senior prom. Consistent with the school's long standing tradition, the students nominated and elected a Prom King and Queen. This year the king and queen elected were Aston Irby and Adam Bell. Facebook was taken down due to specific negative comments directed toward an individual,' Jane Harrison with Anderson District One said.